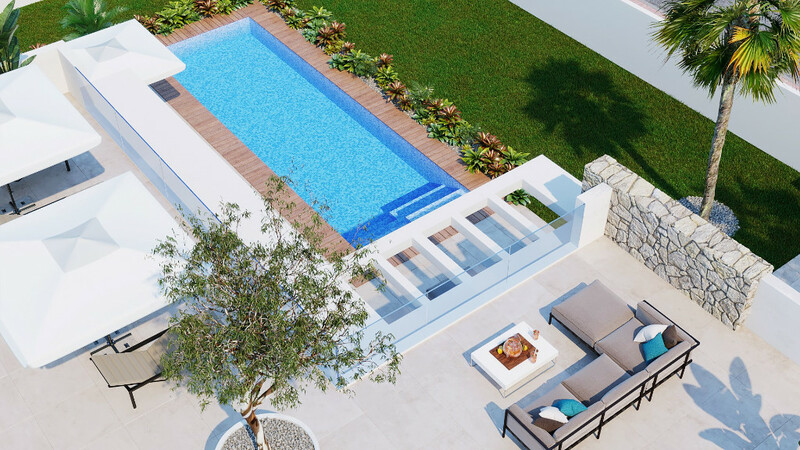 GS SPANISH PROPERTIES established since 1999 has the BIGGEST selection of new build property and is one of the few estate agencies which has ALL new developments. Don't be fooled by lower price tactics that some agents use, we are constantly updating our prices from the developers to ensure they reflect the most up to date price. 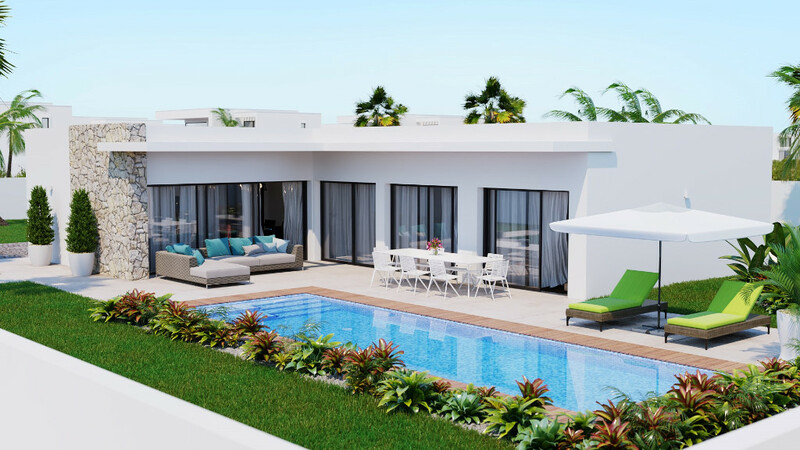 Luxury detached villas with 3 bedrooms and 2 bathrooms and a private swimming pool located in Ciudad Quesada. 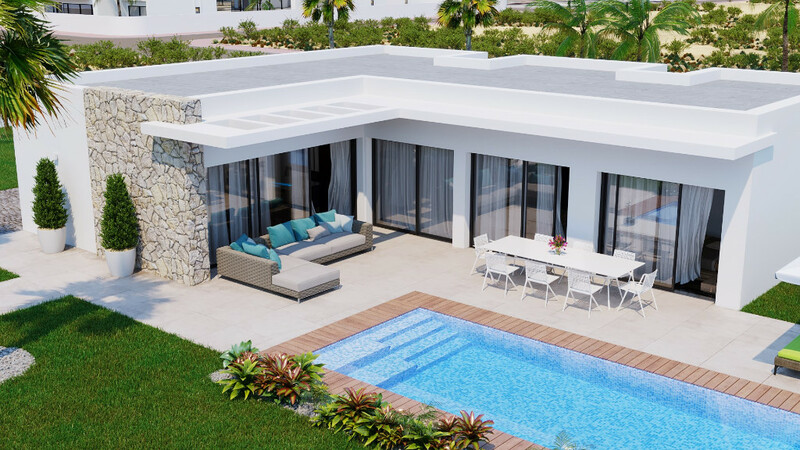 These villas are built with the very latest ultra-modern designs using only top quality materials throughout the properties and are truly finished to the very highest specification. 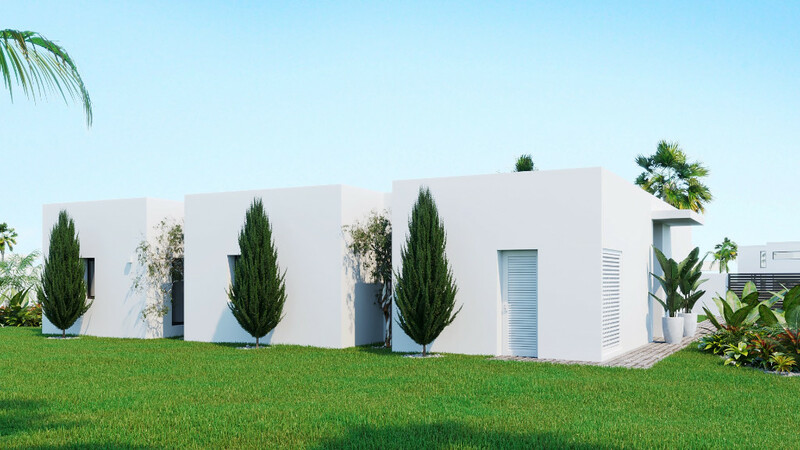 This model is built on a minimum plot size of 500m2 over one floor. The property has an open plan kitchen, a utility room, a spacious living and dining room which has lots of large windows/doors overlooking the pool and terraces, 3 bedrooms, 2 bathrooms, one of which is en-suite to the master bedroom, and an exterior storage room. 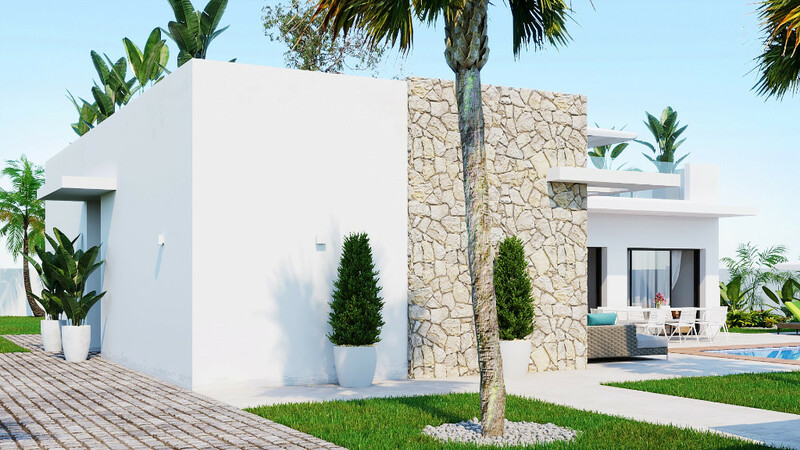 All bedrooms have direct access to the large terrace and pool area. There is the possibility to have a roof top solarium at an additional cost. These villas have a private pool and there is a driveway for off road parking with an automatic car gate. Other features included are exterior light fittings, armoured front door, pre-installation for air-conditioning, a fully fitted kitchen with oven, hob, extractor fan, fridge-freezer and dish washer. 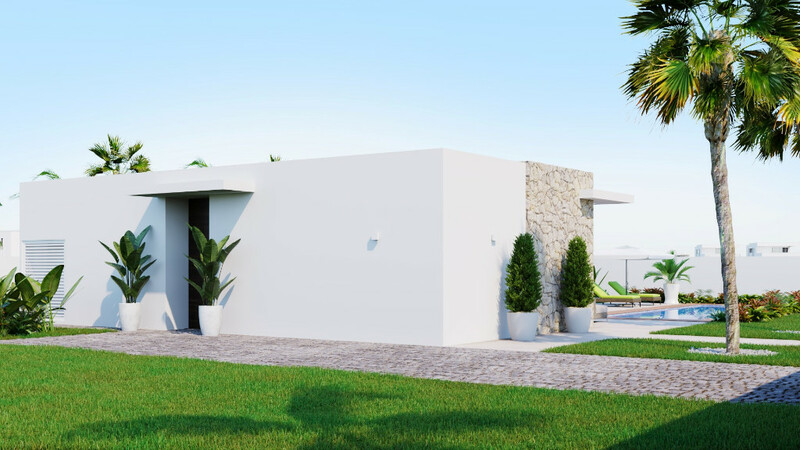 Because of its location in Ciudad Quesada these villas have everything that the area can offer: magnificent views of the Laguna, all services within walking distance such as bars, restaurants, banks, supermarkets, etc. and the proximity of the beautiful beaches of Guardamar, La Mata and Torrevieja. Alicante airport which links to all of Europe is only a 25 minute drive away. 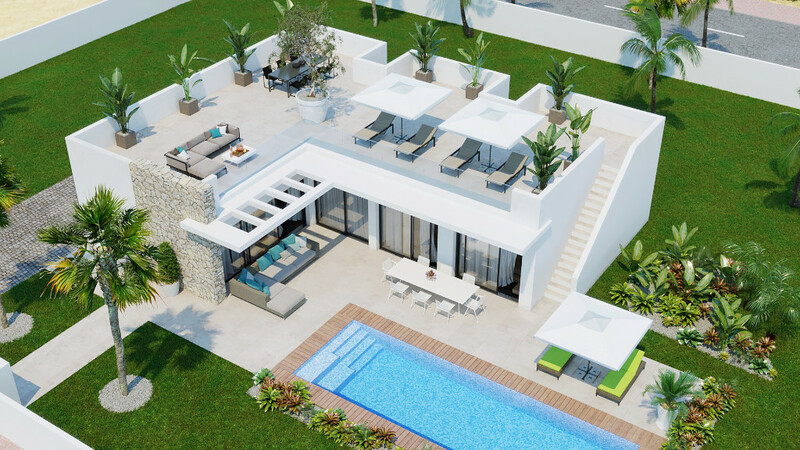 Golf Sun Spanish Properties is a successful family run real estate agency founded in 1999. Our professional team has a wealth of experience and we pride ourselves in being honest and trustworthy, creating a friendly no pressure environment for all our clients. All members of our team have lived on the Costa Blanca for more than 20 years so are very passionate about the area and knowledgeable on all aspects of living here. From the point of first contact we offer you a quality service taking care of you throughout the whole buying and aftersales process. © 2019 Golf Sun Europe S.L.